Want the weather to change? Wait 5 minutes. 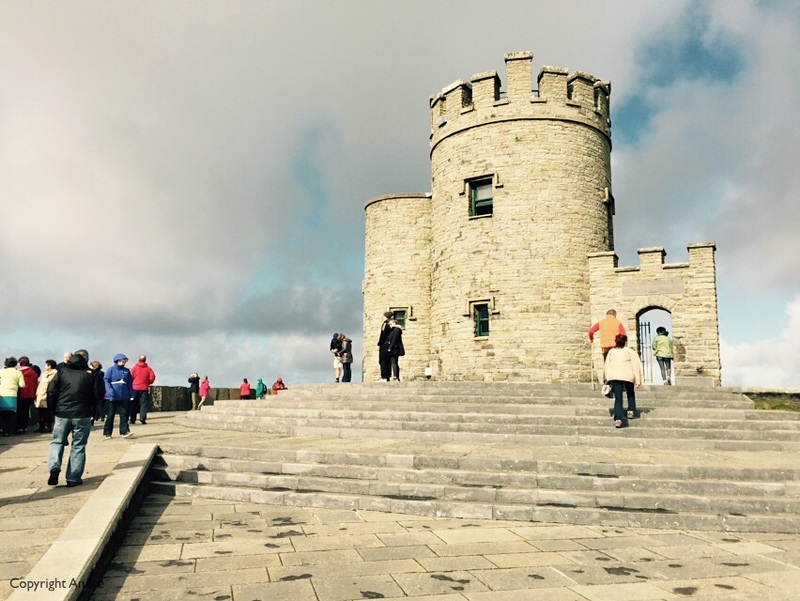 Saturday we packed up Ballykillaboy and headed north west to Limerick. The roads might have a nice official tag to them, such as N24, but they are still the winding two lane roads that have always been there. Every so often we get the “traffic calming ahead” sign and the speed drops to 50 Km/Hr as we get to sight see the next little town on our route. Two hours and Limerick comes into view, we miss the turnoff onto the M18 that bypasses the city center and tunnels under the River Shannon for a fee of €1.90. Double back and in no time we are speeding along at freeway speeds of 120 Km/Hr. 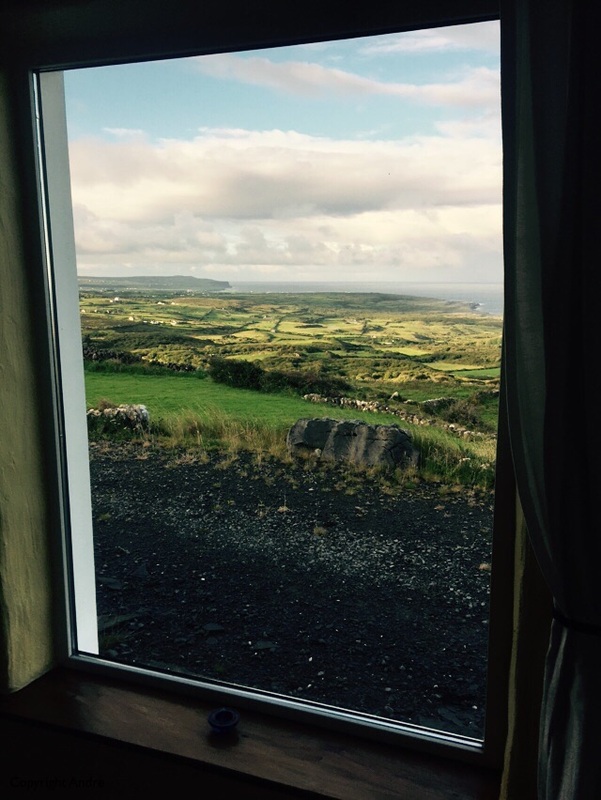 Soon back to the local winding roads and we made our way up to Lisdoonvarna where the cottage owners have a B&B. Tricia greets us and says, “follow me”, as she leads us over what seemed like an endless narrow little road along the mountain/hill side. Eventually, actually it was 2.4Km, we arrive at Creigs Cottage and she gives us a quick run down and says Martin will be round to fix the heating in a while. 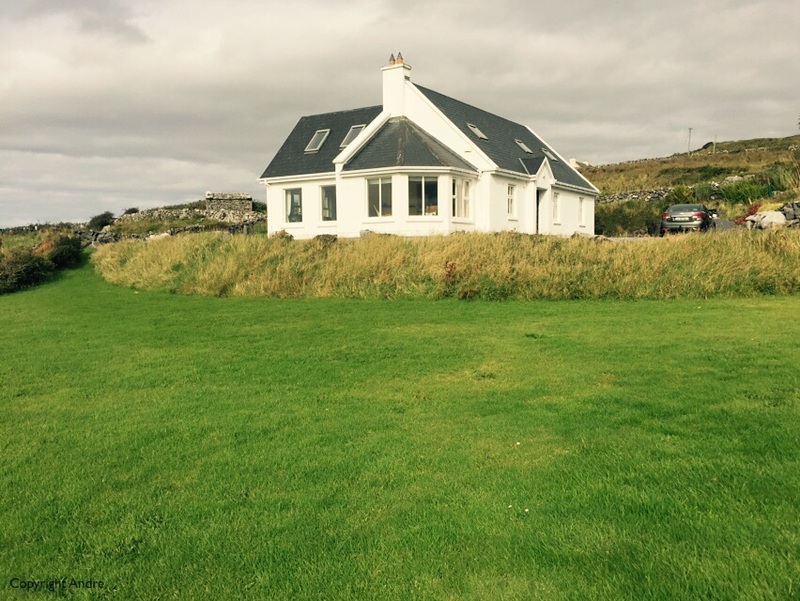 Sun was out on our arrival and the cottage looked cute in the afternoon light. 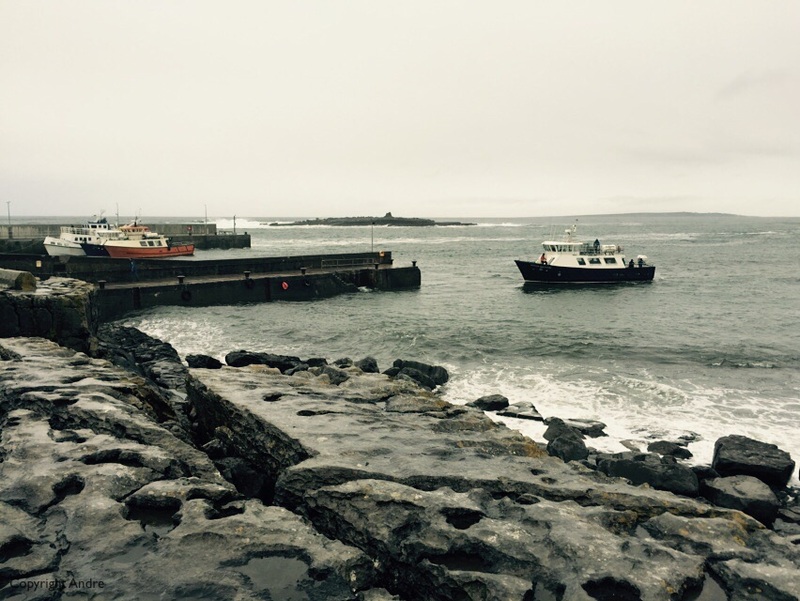 Aran Island ferry at Doolin pier. We were joined by Paddy & Patricia and as Sunday morning dawned rather cloudy and blustery we decided to let Patricia show us around. 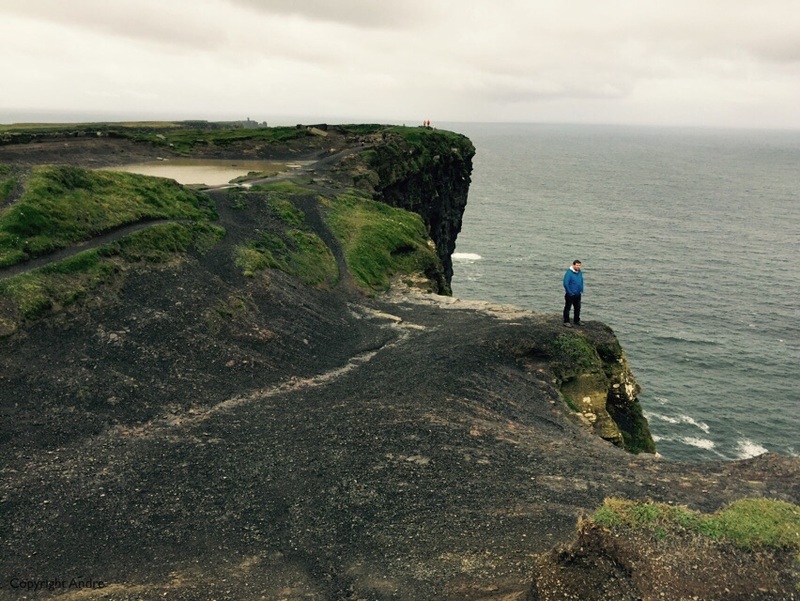 First was to check out the road down into Doolin and the ferry pier for trips out to the Aran Islands. The boat itself looked small as it bobbed up and down in the strong Atlantic swell; we’ll leave that trip for a calmer day. 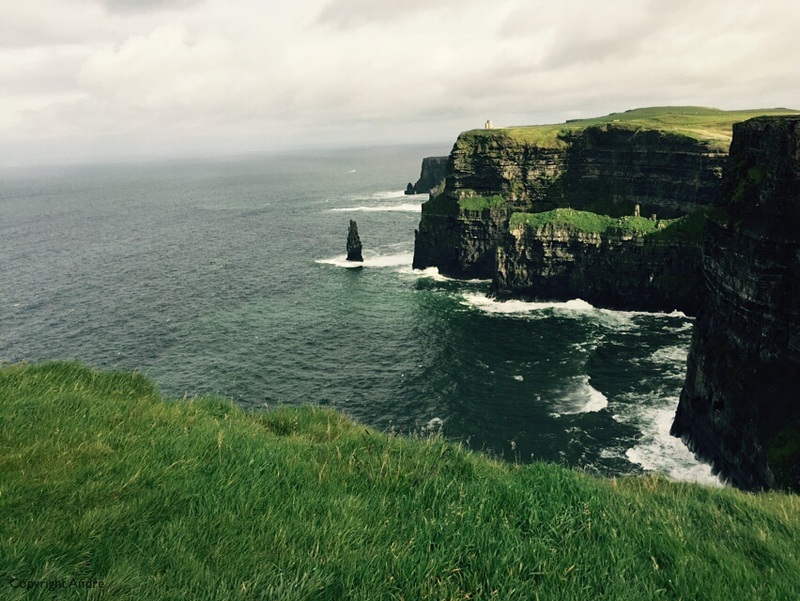 How about Lahinch? 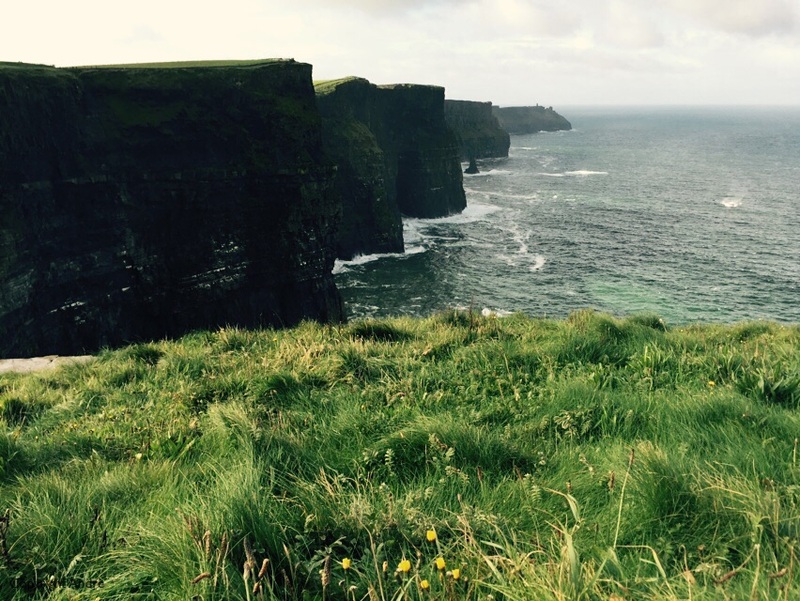 OK as we wound our way down the coast past the cliffs of Moher which we will visit the next day. 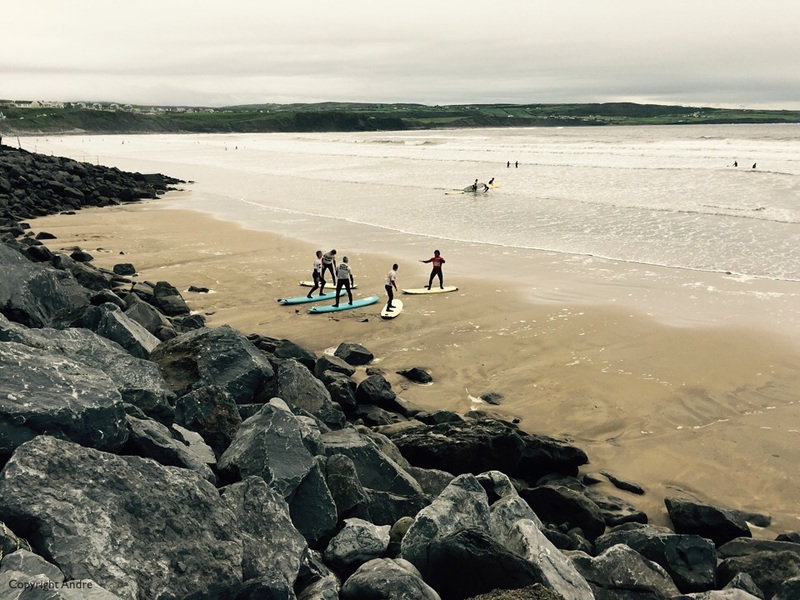 Found out that Lahinch has a bit of a surfing reputation and there were people in the water. Have to be tough to surf these wild Atlantic conditions, most of us would rather stroll along bundled up in our wind proof jackets. 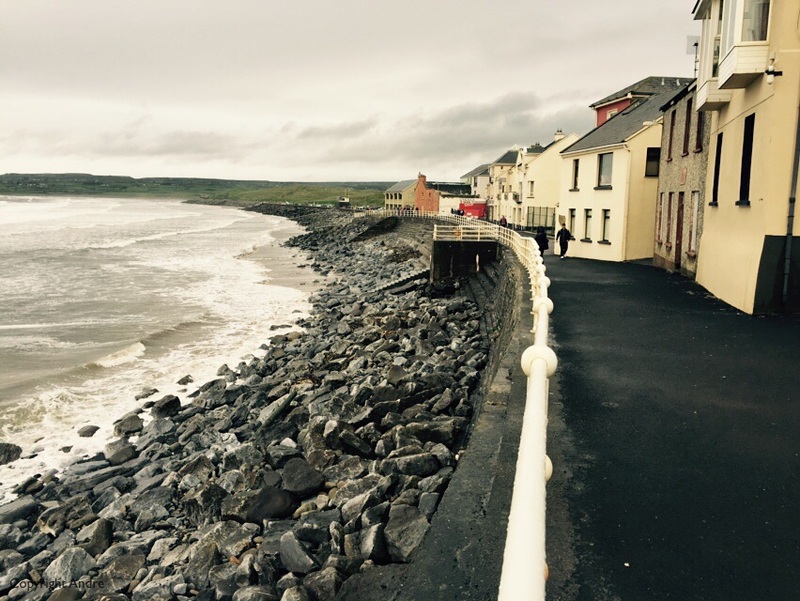 Lahinch’s “malecon” – only for the hardy souls. 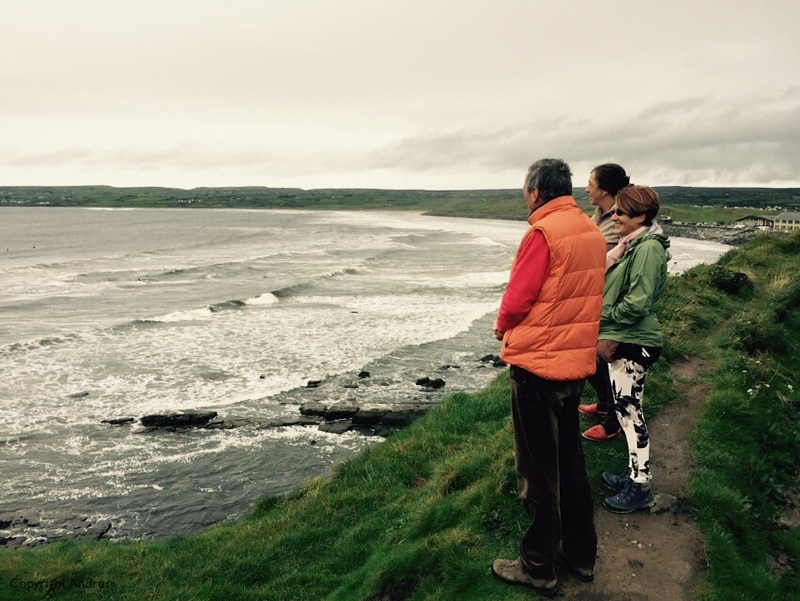 Lahinch bay. Surf a bit ruffled today. Watching the surf from the shoreline. Surf school on the beach! Found a few oddities while wandering around the town. 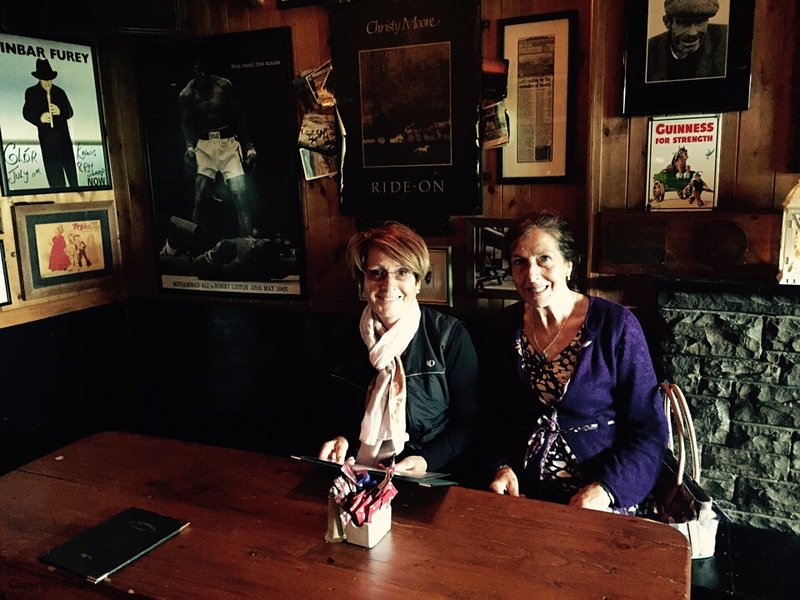 First was a placard on the wall outside the coffee shop reminding us of an unscheduled landing of an American B-24 Liberator that landed on the beach in 1943 while flying from Maine to England. 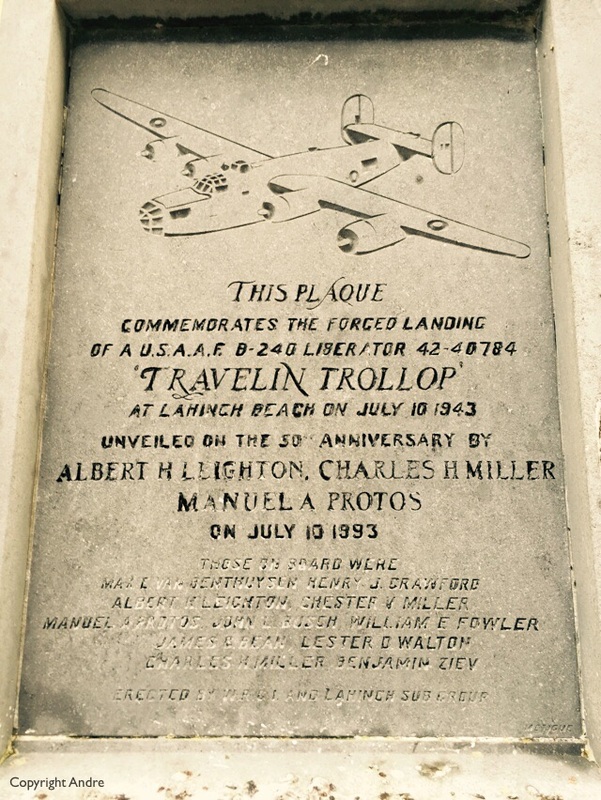 Reminding us that an American B-24, Travelin Trollop, made an emergency landing here in 1943. 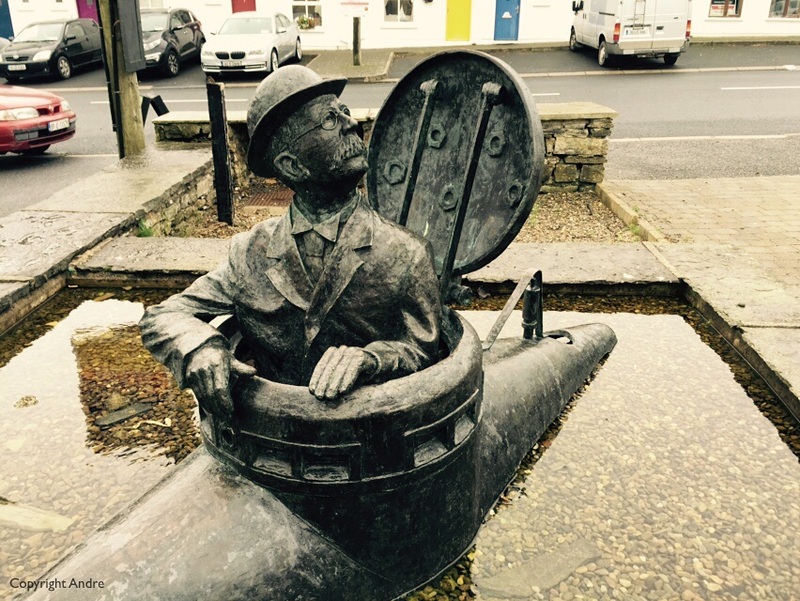 Second was this quirky little monument of a civilian standing in a small submarine – his name was John Holland. 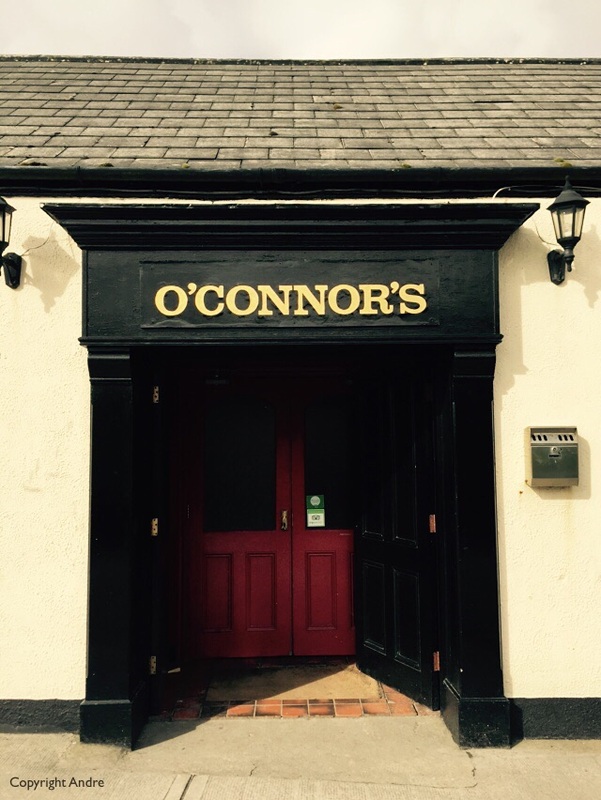 A few Google’s showed that he was credited as being the inventor of the submarine, grew up here in Liscannor near Lahinch. John Holland in the submarine he invented. 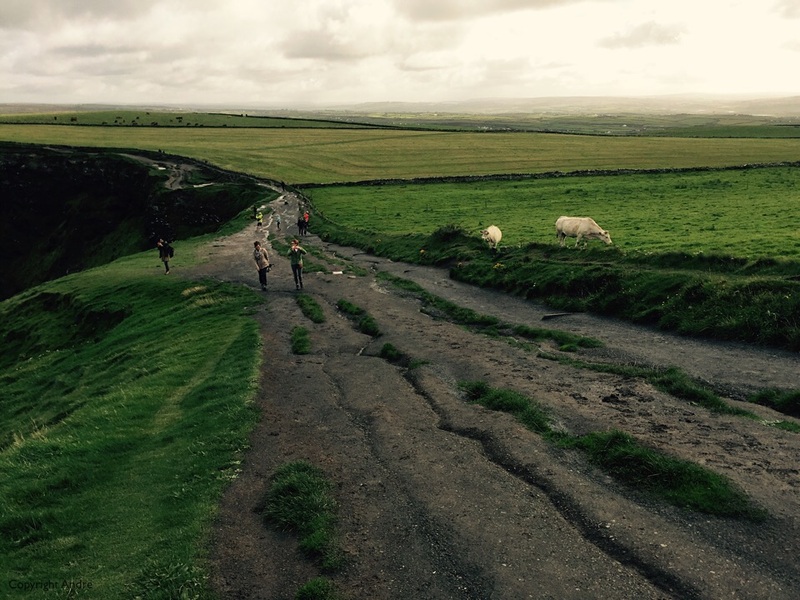 Monday, before Paddy & Patricia headed back to Ballinlaw, it was going to be the cliffs or bust. 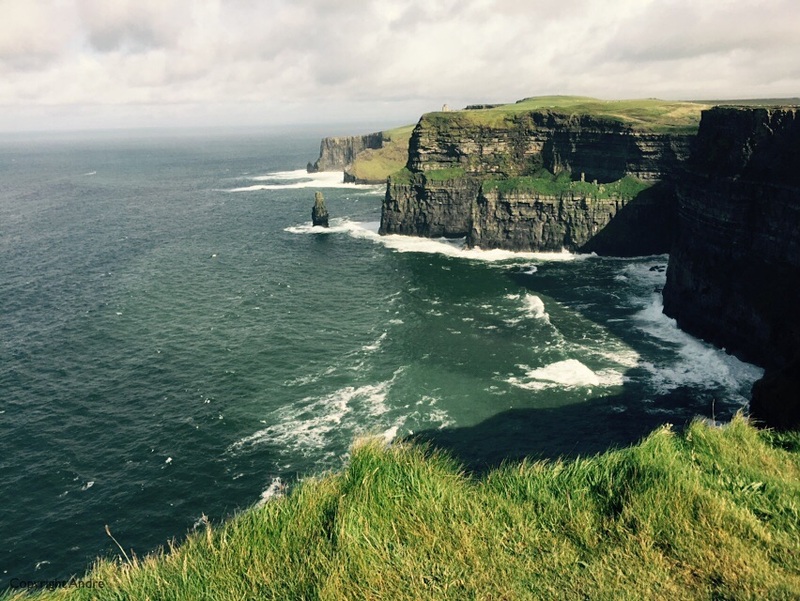 The Cliffs of Moher are a big attraction and well developed to collect €6 from each visitor. 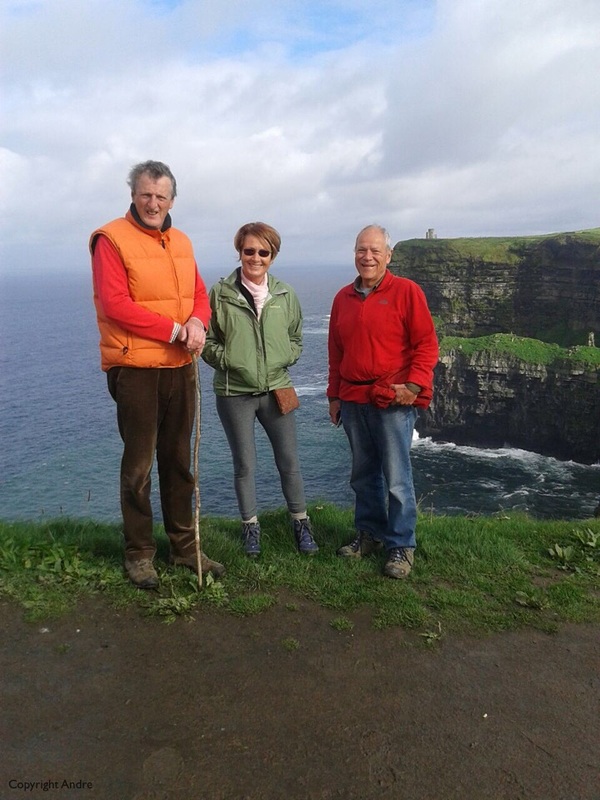 Patricia sneaked us in as seniors for a reduced €4 and we headed out on the walk. 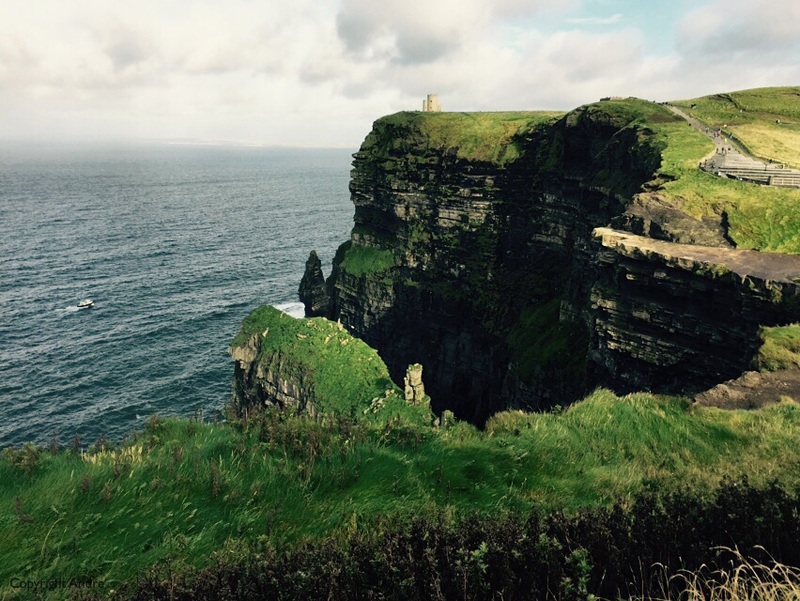 The Cliffs of Moher, shadowed by the morning sun. The uphills can be muddy & slippery. Another view back as we head for the southern lookout. Some can’t resist getting close to the edge for just that little bit more. 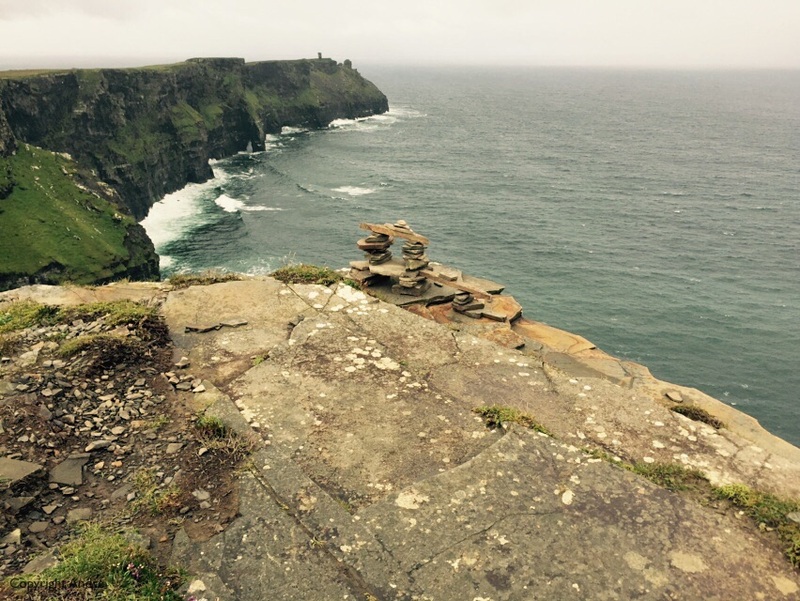 Here people built little stone piles, also close to the edge. Sun stayed out for the walk back. Thanks to Patricia for the photo. 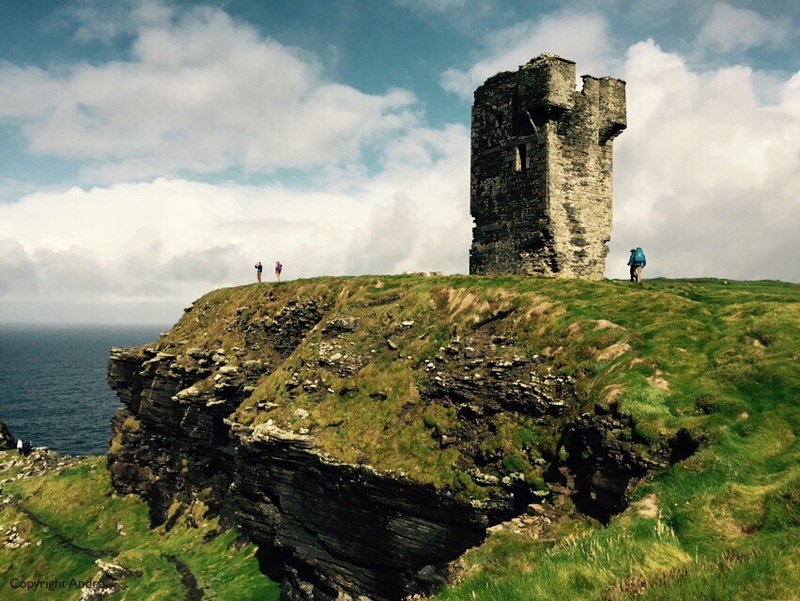 We headed south along the cliffs following the ups & downs and avoiding the many puddles of muddy water. At one point a rain squall came in and we hunkered down to keep dry. I thought it was time to turn around but when I emerged from my shelter the others were merrily marching on and growing smaller by the second. One more squall as we sheltered in the roofless southern tower and then a bee line for the visitor center from where we had started. 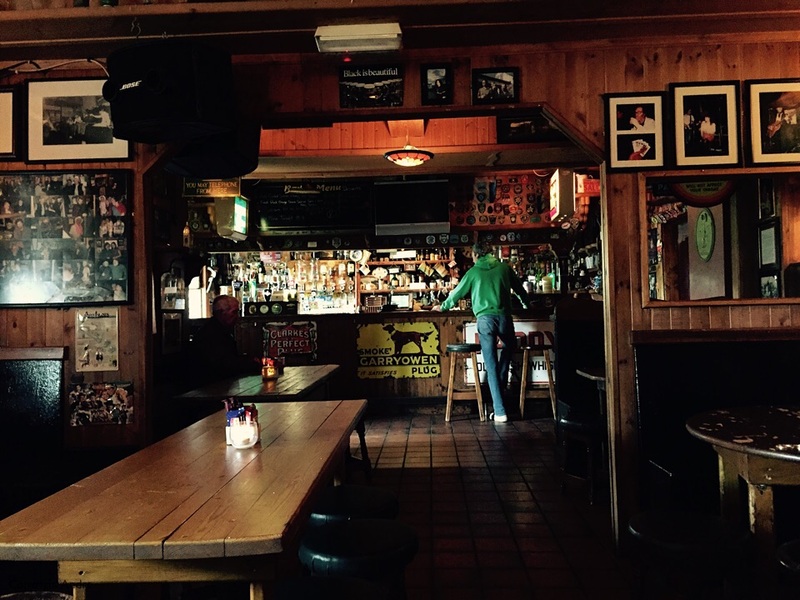 Paddy eyed the place out and declared it too touristy and suggested a local pub lunch instead. Waiting for the pub lunch. My view of the bar. 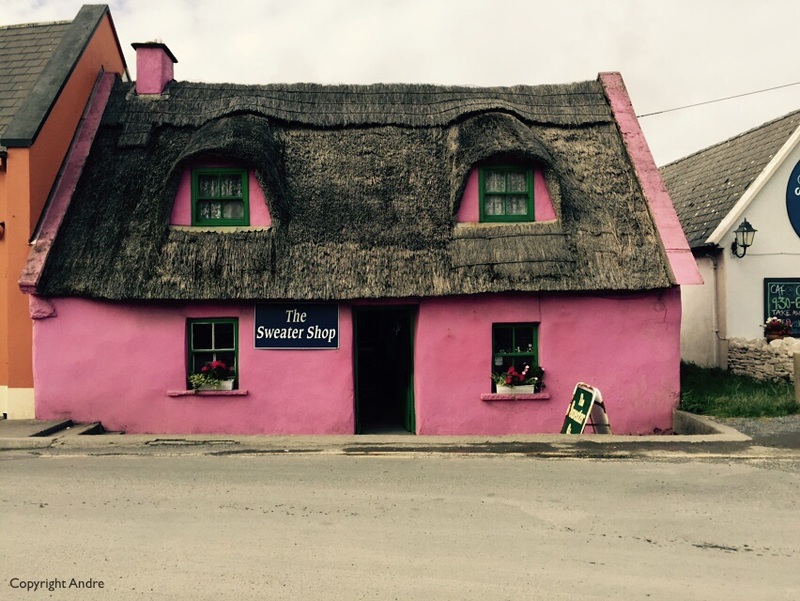 After a pint and a filling lamb shank, Andre’s choice, Paddy & Patricia headed back to Ballinlaw and Rose & I browsed the stores in Doolin. 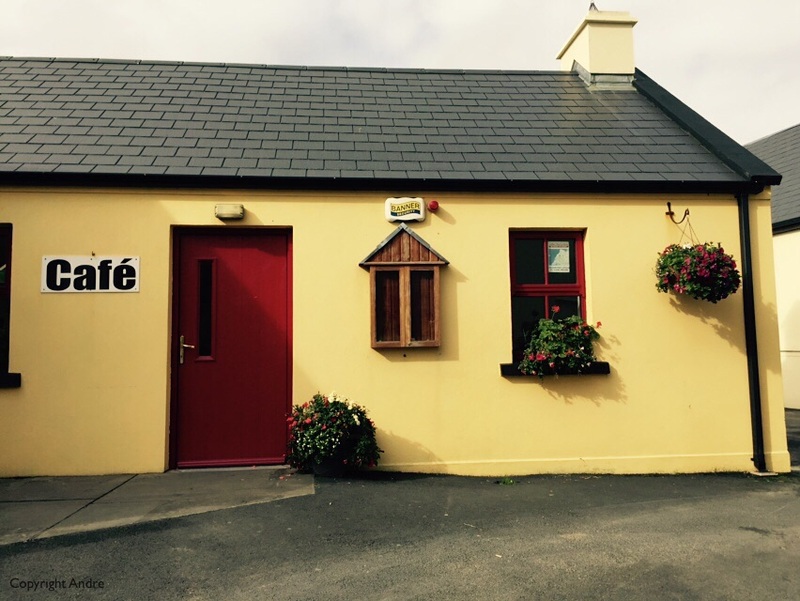 Your local down in Doolin. Comforting on a blustery day. 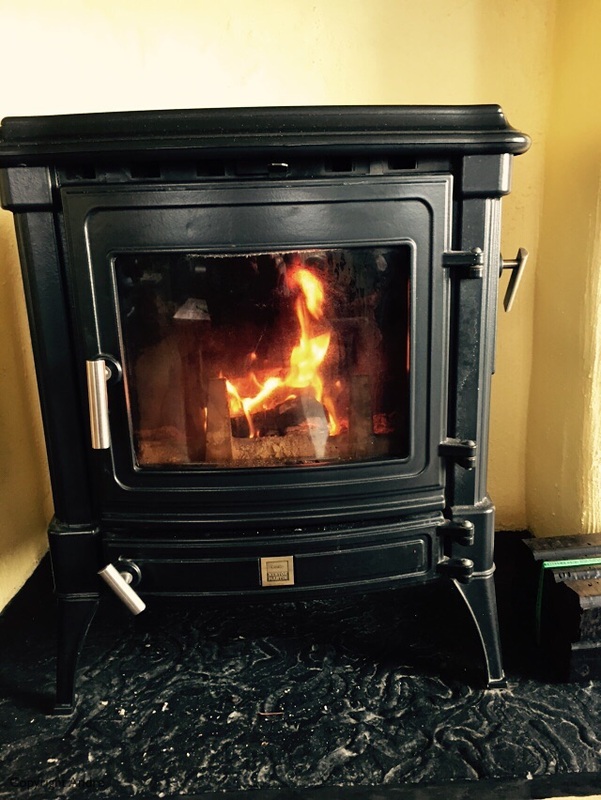 Back at Creig’s we lit the fire and settled in for the evening. 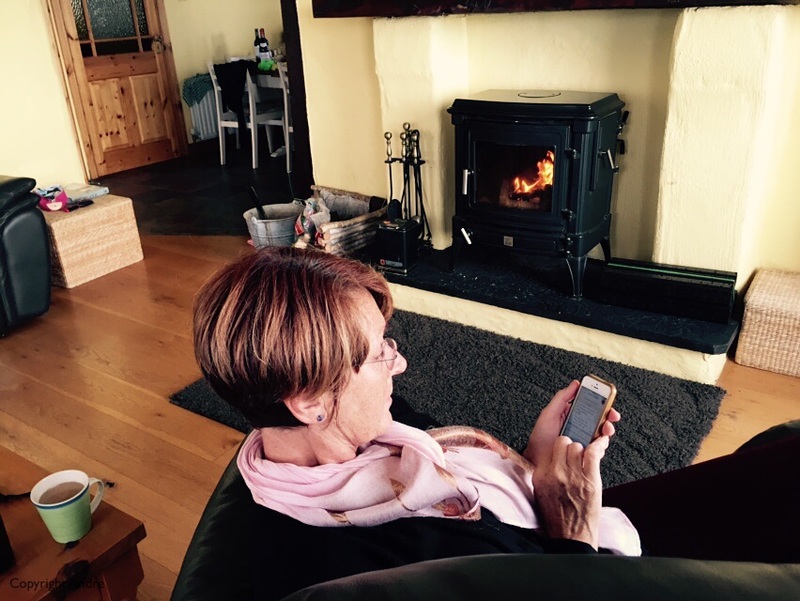 Nothing like your smart phone and a cozy fire. 3 Comments on Want the weather to change? Wait 5 minutes.